Best known as a specialist in exquisite, exotic and expensive tourbillons, Greubel Forsey introduced its first ever time-only wristwatch at SIHH 2016 – a sign of the times perhaps. Named the Signature 1, this entry-level wristwatch is hand-wound and features an extra-large balance wheel, and is naturally decorated to the usual exceptional standard typical of Greubel Forsey. 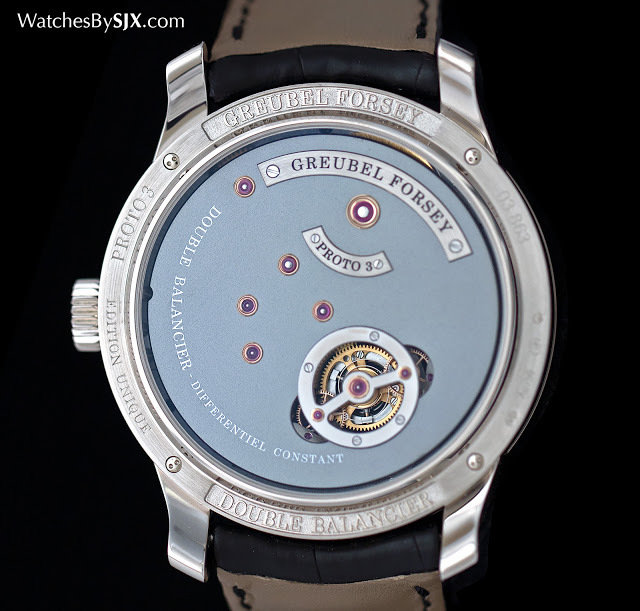 Priced at SFr155,000 in stainless steel, less than half the next most affordable Greubel Forsey watch, the Signature 1 is the brainchild of Didier J.G. 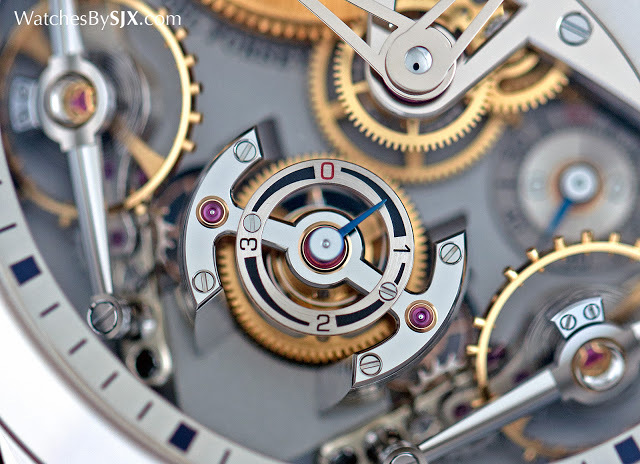 Cretin, a watchmaker at the brand whose name is engraved below the balance. The Signature 1 is the first in a planned series of watches that will each be conceived by a watchmaker at Greubel Forsey. As a wristwatch the Signature 1 is simple but elaborately constructed from expensive materials. 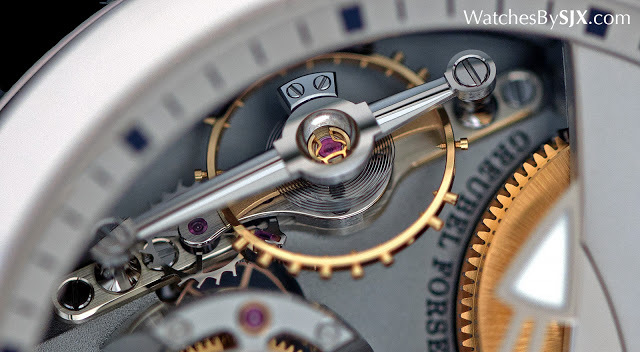 The dial for example is solid gold, while the hands – hours, minutes and seconds – have countersunk centres polished to a mirror finish by hand. And the balance bridge is long and carefully shaped, with wide, polished bevels along its length. Even the escape wheel bridge is solidly and carefully crafted. The view from the back is also impressive, with details like an open-worked bridge for the barrel, as well as jewels set in gold chatons. 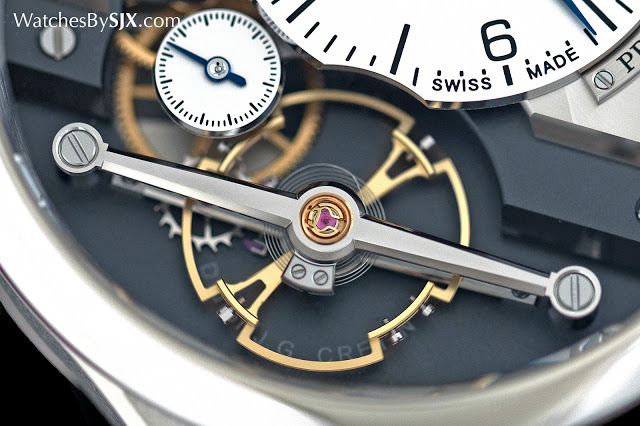 At 41.4 mm in diameter the Signature 1 is a large watch, but feels small by Greubel Forsey standards. 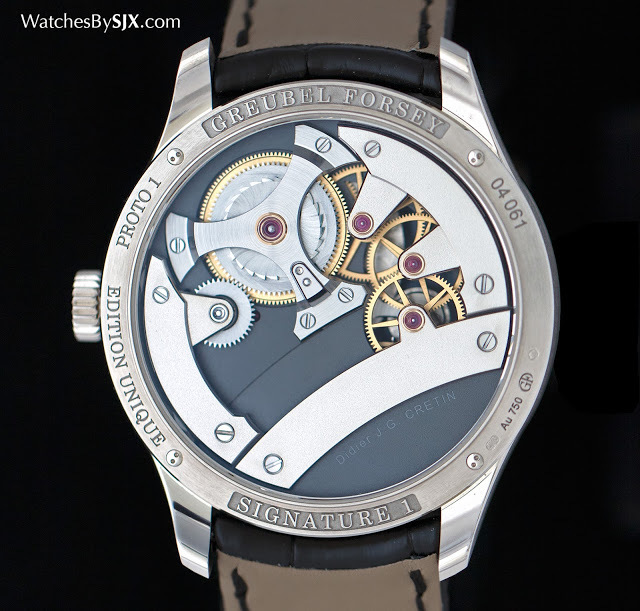 And in steel it is surprisingly lightweight, again in contrast to the usual heft of a Greubel Forsey wristwatch. 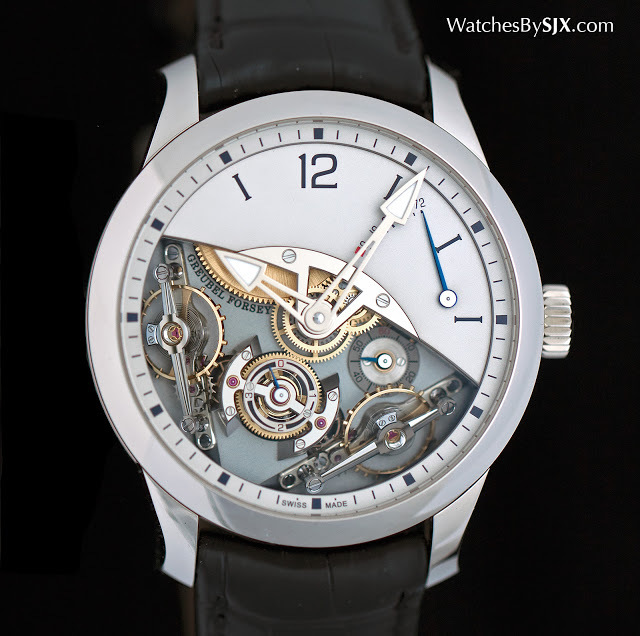 As finely put together as it is, the Signature 1 is still an entry-level Greubel Forsey, a compromise of sorts. 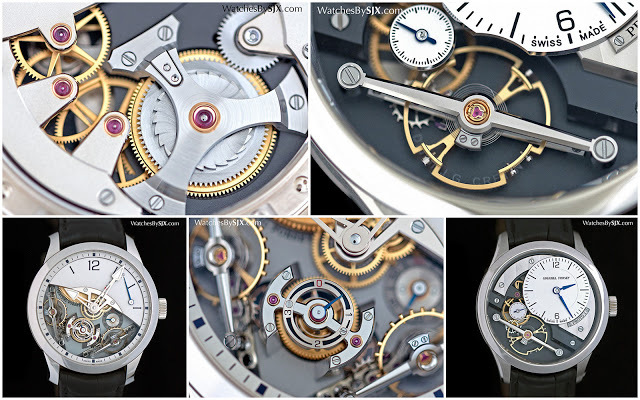 The average high roller who can afford a Greubel Forsey tourbillon – a president-for-life or Forbes lister – does not need an entry-level Greubel Forsey (except to give away). Those who wallets make such a watch a necessity, however, have other watches to consider, like a Voutilainen Vingt-8 for instance. Limited to 11 pieces each in steel, red and white gold, the Signature 1 is priced at SFr155,000 before taxes, and in red or white gold it’s about ten percent more. 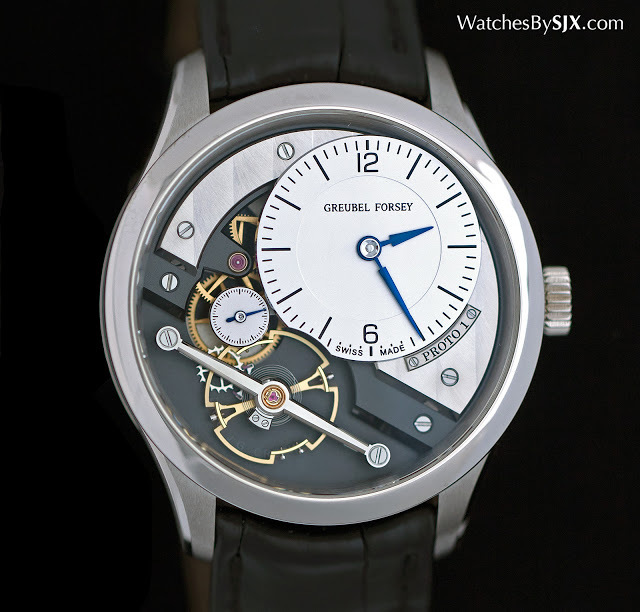 The other new wristwatch unveiled by Greubel Forsey is more typical of the brand. The Double Balancier à Differential Constant features twin, inclined balance wheels linked by a differential that averages out the rate of the two. 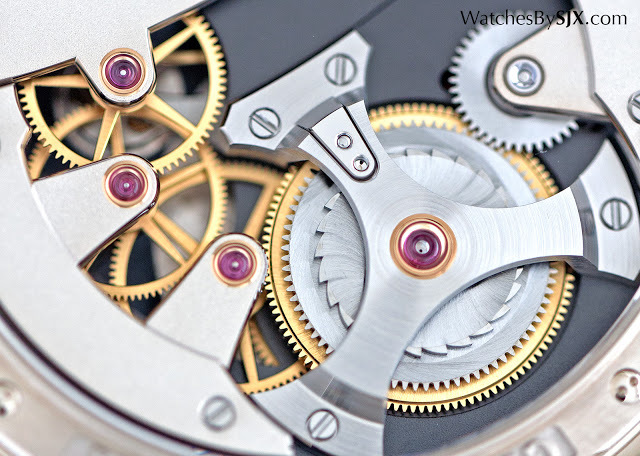 It is essentially a variant of the Double Balancier 35° unveiled in 2013, with the intricacies of the twin regulators and differential revealed. The dial is a pleasing juxtaposition of a plain half-dial with a power reserve indicator, with the rest removed to expose the two balance wheels. This allows all the beautifully finished components to be admired from multiple angles. All the is on the front, with the back being a single plate with a frosted finish that is a signature of the brand. Limited to 33 pieces in a 43 mm white gold case, the Double Balancier is priced at SFr350,000.